OUT OF PRINT. 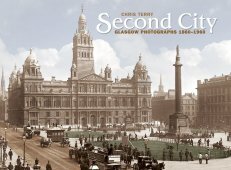 A collection of classic Glasgow photographs when the city was at its zenith. There all the elements that made Glasgow great: the world-renowned industries, the majestic buildings, the elegant streets, the exclusive shops, the beautiful parks, the grand theatres, cinemas, hotels and restaurants, the museums and universities. The individual locations include: Sauchiehall, Buchanan, Renfield, Argyle, Union and St Vincent Streets; George Square and St Enoch Square; Central and St Enoch stations; Marks and Spencer, Woolworth's, Watt Bros, Copland and Lye, Wylie and Lochead and the Barras; Empire and Citizen's Theatre; Kelvingrove and Phoenix parks; Glasgow University (old and new buildings) and Glasgow Cathedral; the Clyde and Glasgow harbour; shipbuilding and railway manufacturing; Charing, St George's, Shawlands and Bridgeton Crosses; Glasgow's old pubs; the Old Firm and Hampden Park; trains, trams , cars and buses; the slums, steamies and back closes. Many great photographers are represented: George Washington Wilson, Thomas Annan, James Craig Annan, Bert Hardy and Haywood Magee as well as exponents from prominent newspapers and periodicals like The Scotsman, Daily Record, Sunday Mail and Picture Post. The photographs are reproduced on the highest-quality art paper and are generously sized, with many full page.